Our goal is to raise awareness of the incidence and devastation of childhood cancer in America's children. By raising awareness that childhood cancer is the number one disease killer of America's children, we hope to raise awareness for the families that find themselves in this battle. Side effects are increasingly damaging. Therefore you could say that survival comes with a high price tag. Cancer is the #1 cause of disease related death for children and the second overall cause of death of children in the United States. 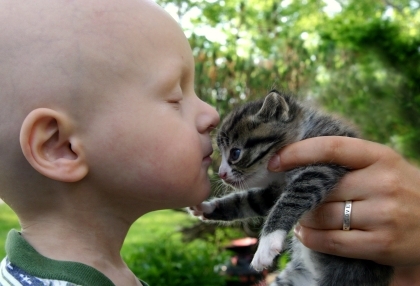 Cancer kills more children than Cystic Fibrosis, Muscular Dystrophy, Asthma and AIDS COMBINED! Each school day 46 children are diagnosed with cancer. Cancer claims the lives of an average of 10 children every day in the US. One in every 330 children will develop cancer by age 20. Each year in the U.S. over 15,000 children are diagnosed with cancer. One quarter of those children will die within 5 years from the time of diagnosis. There are currently more than 300,000 childhood cancer survivors in the U.S.
Late effects of childhood cancer treatment are common among the survivors with 1/3 being moderate to severe. 80% of all children have metastatic disease at time of diagnosis compared to only 20% of adults (this means we are not catching it early enough and the disease has already spread to other organs).